Skin Care Tips for Kids + Giveaway! UPDATED: Congratulations to the following three winners, who have each won a bottle of PHYSIOGEL Cleanser (300ml)! Kindly email me at kelvin(at)cheekiemonkie.net to collect your prize. Once again, congratulations and a big THANK YOU to everyone who had participated! Take part in the ongoing LEGOLAND Malaysia Tickets Giveaway to win 4 tickets to the theme park! Did you know that in Singapore, one in five children suffers from eczema, a chronic inflammatory skin condition characterized by an itchy red rash? And to make things worse, it usually favours the skin creases such as folds of elbows or behind the knees. We are kind of fortunate that the 2 boys didn't exhibit any extreme forms of eczema so far. For Ale though, she has been having patches of dry skin on and off of late which is usually made worse when she scratches them uncontrollably. 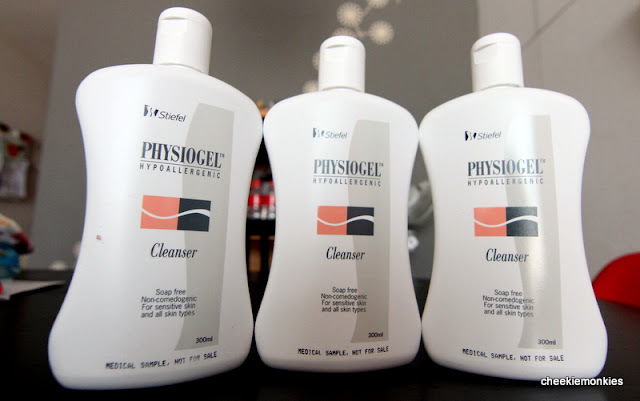 So when PHYSIOGEL offered to send some of their dermatological products to us, I was game to give it a go... and as it turned out, so too was Ale. We zoomed in on the PHYSIOGEL Lotion, which is essentially a hypoallergenic moisturising cream that contains physiological lipids that are natural and essential components of normal healthy skin. I love the fact that the lotion contains no colourants, no perfume and no preservatives, which makes it suitable for daily use on children with dry and sensitive skin conditions. Ash too, was raring to give it a go though I highly suspect he loved the fact that he was being treated like a king while his limbs were being moisturised automatically. If your child is suffering from a more severe form of eczema, fret not. 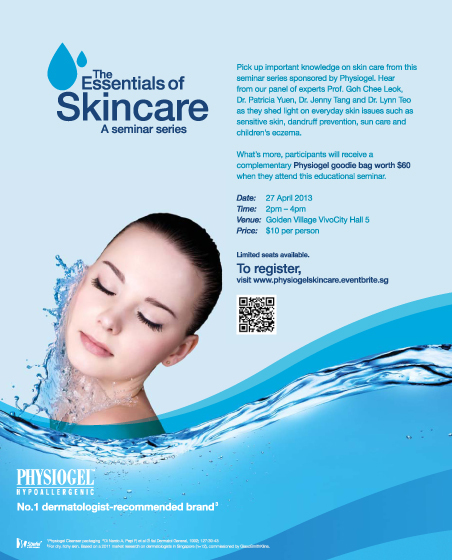 PHYSIOGEL will be organising a seminar on 27 April 2013 (2-4pm) titled 'The Essentials of Skincare' where skin care doctors will be on hand to share important knowledge on everyday skin issues such as sensitive skin, dandruff prevention, sun care and of course, children's eczema. For children's eczema, paediatrician Dr Jenny Tang will be shedding light on the treatments available for eczema and daily care guidelines like what types of clothes to wear and how to reduce allergens within the house environment, so as to keep eczema under control. Tickets are priced at $10 each and in return, participants would receive a PHYSIOGEL goodie bag worth $60. To book your tickets, kindly visit http://physiogelskincare-es2005.eventbrite.sg/?rank=1. For more details, kindly refer to the seminar poster below. When will 'The Essentials of Skincare' Seminar be held? Leave your answer either in THIS BLOG POST, or in the FACEBOOK POST of this article. Three winners will be picked randomly.This giveaway is open to residents in Singapore only and ends on 14th April 2013 (Sunday) at 2359 hours. PHYSIOGEL Cleanser is a hypoallergenic, non-comedogenic soap-free cleanser that cleanses, soothes and softens without drying the skin. Its non-greasy formula does not contain animal fats, providing a gentle cleansing and maintenance of the skin's natural pH balance. It is a low-foam formula that cleanses thoroughly with or without water and is suitable for sensitive skin and all skin types, including babies. The seminar will be held on 27 April 2013. Good luck for those who participated! Results for the giveaway are out! Find out if you are one of the lucky 3 winners here in the updated post above!